One of my co-workers introduced me to Go Fug Yourself a few years ago, and I've loved reading it ever since. My favorite posts are, unsurprisingly, their hilarious TV recaps (I read every single one for Lindsay on OWN, despite never watching the show) and anything they post about royalty. When I found out they had an adult novel being published, I was excited. But when I discovered it was basically inspired by William and Kate? I think my reaction went beyond excited and crossed into OMG I WANT IT NOW! I started this book on a Thursday night, and it was all I could think about at work on Friday. I wanted to sneak chapters under my desk and spend my lunch break reading in my car so no one could distract me! I chatted with my husband for a bit when I finally got home, and then I retreated to our bedroom to read for hours. I wasn't going anywhere until I finished this delightful story! I'd been in the middle of a reading slump, too, so it was a relief to have that "GO AWAY I'M READING" feeling again. The Royal We is set in a world that's familiar - but slightly different. You are experiencing a version of William and Kate's romance, so you'll likely anticipate many of the events and characters that populate this story. You'll get to meet the impish younger brother, Freddie, and the sister who frequently finds herself in the spotlight, Lacey. There's the stiff and detached father, Prince Richard, and a whole host of other somewhat familiar faces. But that just added to the fun for me! The authors don't stop there though. You'll also meet Bex and Nick's friends, and they quickly became some of my favorite characters. None of the characters are one-dimensional or stereotypical. Each is complex and realistic, which takes the story from fan fiction to a well-developed and layered book. The fascinating premise is elevated by the talented writing! It may be inspired by real people and their relationship, but it stands on its own merit. The authors have written about the research they did for this book, and it absolutely shows! They immersed themselves in Great Britain, which allowed them to bring the world to life in the pages of this book. I felt like I was back in Oxford (where I studied abroad during college) - and it made me long for an extended trip so I can explore every nook and cranny of England! If you're an Anglophile, you're going to want to read this book. We were interviewing potential new agents, and got into a long discussion about Kate Middleton with a woman named Brettne Bloom with whom we'd eventually be lucky enough to sign. We were digging into what a surreal experience this must be for Kate Middleton, and how her private life is probably so different than any of us imagine, and what it must have cost her to live the public life that she now does. And Brettne basically was like, "That's a book that needs to be written. Someone has to write it," and Jess and I effectively raised our hands and started salivating. The gaps in public and private life for royal family members seem like they must be larger than with a lot of other people. Being a movie star with a clean image is one thing, but being the sovereign of a nation and all that entails... that is a whole other kind of facade. While I've briefly thought about what a sovereign has to sacrifice, I'd really never considered what it would be like to grow up with that kind of weight on your shoulders... or to marry into it without having been prepared for the role. There were moments when I wondered if it was worth it. Could I give up my privacy - my Saturdays in pajamas watching Netflix - just to be with the person I love? Could I spend the rest of my life with the public watching my every move? William and Kate have always seemed like a fairy-tale romance, but this is the first time I stopped and thought about pressure and responsibility that goes along with it. For that reason alone, I think this book is worth reading! But you know what's great? That's not the only reason to read The Royal We. This is the kind of adult fiction I crave! It's a book I'd love to read on the beach but would be equally comfortable discussing with a book club. It's proof that a book can be entertaining and thought provoking. I'll be pushing this one on my reading friends and my non-reader but royalty-loving friends. I had a feeling I'd enjoy this one, but I'm happy to say that I absolutely loved it. It's one that I want on my shelves and plan to re-read! "I fell in love with a person, not a prince; the rest is just circumstance." 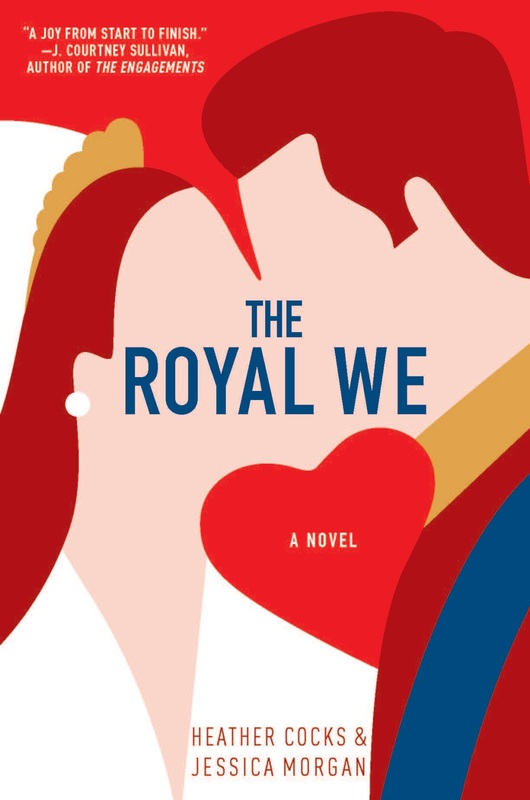 Augh, Hannah, I am having the exact same feelings for The Royal We - I'm not quite done yet, but seriously, as soon as I got it from Edelweiss a few days ago, I needed to read it immediately and I could not put it down. I was also surprised by the depth of the discussion of paparazzi and PR, and I am so annoyed that I didn't finish yesterday, because I am DESPERATE to know how this ends. When I first saw the cover of this one I knew I wanted to read it. And now, after your review, it's only cemented that opinion. Definitely one I'm now really, really looking forward to!